Every human experience is bi-polar. It is pulled by the attraction of the individual factor in experiencing, and also by that of the collective factor. These two pulls are of varied relative strengths. Education (a collective factor) gives more strength to the collective aspect of experience; thus an educated man may not go as wild under the stress of emotional disturbance as an uneducated person who will kill if jealousy possesses him. But the strongly individualized artist may lose his emotional balance faster than the business man who is steeped in social respectability. To the Romantic artist the world at large may appear thus as a grandiose tragedy; but the English gentleman will drink his tea while the Empire crumbles, unconcerned to the last moment with the impact of chaos. From the point of view which has been described in the above paragraphs the substance and foundation of all is human experience. Every valuation is referred to it. All dualisms are contained within it. The sky is one aspect of human experience; the jungle, another. The Sage whose life is ordered and at peace, and whose love includes all forms of relationships possible to man (as today constituted), is a "lesser whole" who has reached a kind of integration sustained and measured by the organic order of the "greater whole." He is at peace with himself, because the peace of the "greater whole" is within him. He is at peace with other men, because his relationships to them are, in his consciousness, expressions of, and contained in his relationship to the "greater whole." They fit into a universal picture. Each piece of the jig-saw puzzle is where it belongs. The image of the whole is clear. There is no longer any question of the existence of chaos. Chaos is the path to a greater wholeness of being and consciousness: a path, a transition, a process. The Sage is he who, first of all, understands this process, feels its rhythm, realizes the meaning of its polar attractions and repulsions. He is the man who sees all nature as a cyclic interplay of energies between "lesser wholes" and "greater wholes." Within him as without, he witnesses individual pain transforming itself into collective peace, and collective fulfillment sacrificing itself into the inspiration and guidance which those who are identified with the "greater whole" can bestow upon "lesser wholes" still struggling with the problems of their atomistic and painful relationships. A cyclic interplay of polar energies: in this phrase can be found the key to an interpretation of human experience which does not produce irreconcilable dualities and the ever-present possibility of schizophrenia and nationalistic or class wars. 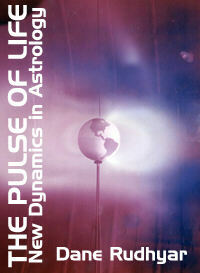 Life is a cyclic interplay of polar energies. Every factor in experience is always present, but it manifests in an ever varying degree of intensity. The waning of the energy of one pole within the whole of experience is always associated with the waxing in strength of the other pole. Two forces are always active. Every conceivable mode of activity is always active within any organic whole, but some modes dominate, while others are so little active as to seem altogether inexistent. Yet non-existence is a fiction, from our point of view. It should be called instead latency. No characteristic trait in the whole universe is ever totally absent from the experience of any whole. It is only latent. And latency is still, in a sense, activity of a sort. It is a negative, introverted kind of activity. Such a philosophical approach to the problem of experience gives to astrology a meaning and a value which few contemporary thinkers suspect it to contain. Astrology can be seen, in the light of this world-philosophy, as a remarkable tool for the understanding of human experience considered as the field for a cyclic interplay of polar energies or attitudes. Astrology is a means to see human experience as an organic whole, a technique of interpretation, an "algebra of life." It uses the ordered pageant of planets (and to a lesser extent, of the stars) as a symbol of what can happen to a man who sees life whole. Every event in the experience of that man is part of an ordered sequence, as every piece of the jig-saw puzzle is part of a complete picture and � because of this, it acquires meaning.